A MAN WHO set up a Facebook group to collate images of women eating on London Underground trains has responded to the backlash against the page. Women Who Eat On Tubes features candid snaps of women eating food while on the train, all of which were taken without their permission. After weeks of debate, Facebook temporarily took the page down this morning, much to the dismay of founder Tony Burke. Speaking on BBC Radio Four, he claimed he had never intended to cause any harm. “I set the page up for me as a observational study, just like any kind of reportage photography”, he said. It was an observation… and random… It was an observation I made that more women than men eat on the Tube, and therefore it would be a richer vein to mine. Burke went on to argue that he hadn’t been doing anything wrong. I think we have a right to take photos of people without asking their permission, I think I was trying to capture a moment, and create something artistic. Facebook reinstated Women Who Eat On Tubes this afternoon, but the group – which boasts over 21,000 members – is now private. “WWEOT is observational not judgemental. It doesn’t intimidate nor bully”, the page’s official blurb reads. Women are embraced and cherished. We celebrate and encourage women eating food on tubes. We do not marginalise them. We always look for the story in the picture. Email “Women Who Eat On Tubes founder says Facebook page is 'an art project' ”. 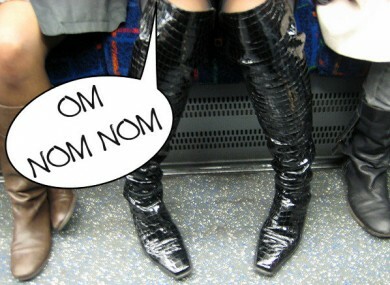 Feedback on “Women Who Eat On Tubes founder says Facebook page is 'an art project' ”.